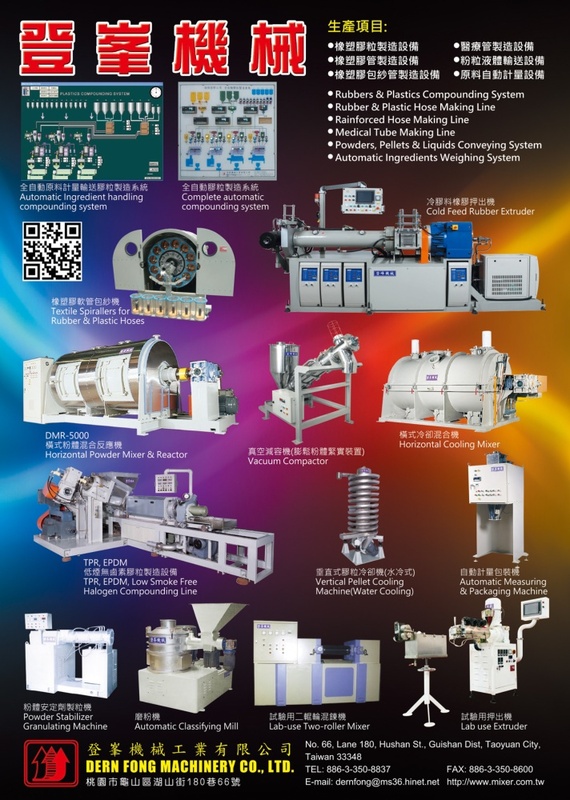 DERN FONG MACHINERY CO., LTD. is dedicated in "Extruder/Granulator, High Speed Mixer, Pellet Cooling Machine, Pellet Conveying Equipment, Auto. Packing Machine, Banbury Mixer, Materials Dosing & Conveying Systems, Auto. Metering, Conveying & Mixing Equipment, PVC Cables, Hoses, Pipes, MR, CR, CPE, EVA, EPDM, Pneumatic Conveyance Equipment, Automatic Measuring Equipment, Mixing & Kneading Equipment, Mills, Granulating Equipment, Dehydrating, Dehumidifying, and Drying Equipment, Sizing Screens, Powder Bulk Density Increasing Machines, Plastic Granule Cooling Equipment" with operations in Taiwan.